Every Tuesday and Wednesday during the month of May, we’ll be hosting a gluten-free guest blogger from around the web in honor of Celiac Awareness Month. Today we’re thrilled to be hosting former Bon Appetit food editor Kristine Kidd of KristineKidd.com, who shares how she’s adapted her eating and cooking style after being diagnosed with celiac disease. I had developed celiac disease. I knew immediately that in order to be happy, I had to eat as well as I always had, and that meant focusing on fresh, simple, farmers’ market-inspired dishes. Since I am interested in everything about food and cooking, this challenge turned into an enthralling and satisfying project. I attended celiac conferences, read books, and, best of all, experimented in the kitchen. The tactic I developed involves cooking dishes that are naturally gluten free rather than creating disappointing versions of recipes that rely on wheat, rye, or barley. Keeping the focus on fresh ingredients almost guarantees great flavor, with the added bonus of delivering good nutrition too. And eating healthfully is particularly important when we first get our diagnosis. Vibrant vegetables, fresh herbs, and seasonal fruit star in my meals. Menu planning starts with a look at what’s in season—right now that would include fresh asparagus, English peas, baby kale, tender green beans, spring onions, juicy strawberries, and early apricots. These might get paired with seafood, poultry or meat, satisfying legumes, nutty brown basmati rice, creamy polenta, or fingerling potatoes. To complete the meals, I make quick sauces that are based on fresh ingredients too, things like: pesto laced with nuts, basil, mint, and lemon; bold vinaigrettes featuring thyme from my garden; Greek yogurt augmented with olive oil, lime juice, and Serrano chiles; corn and tomato relishes; fresh fruit salsas; and quick guacamole. The best part about this approach is that I don’t feel deprived. I serve my fresh gluten-free food to my gluten-eating friends and family, and no one ever notices that anything is missing from my table. Kristine Kidd is the author of Weeknight Gluten Free and Gluten-Free Baking. 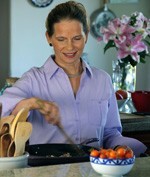 She has celiac disease and writes about fresh gluten-free food on her blog, kristinekidd.com. She lives with her husband Steve Peck, who is president and CEO of the nonprofit U.S. VETS, and their black lab Atticus Finch.